Rita and I met with beekeepers from across the state of Tennessee. Many reported that they experienced heavy over-winter losses of colonies, mainly due to starvation. The honey production from 2009 was also extremely short of expectations, matching annual results for the United States. The year 2009 is being called the worst year ever for beekeepers. In many cases there was just not enough honey in the hives to sustain the bees over the winter. Those with weak colonies should feed their bees to help them through the critical month of March. Melissa Petersen, the editor of Edible Memphis magazine, sent me a picture and asked me to identify the bee in the picture. It looked a lot like a honey bee, and it looked a lot like a yellow jacket wasp. However, the insect was truly a fly. Honey bees have a hairy, fuzzy body. The fly had a smooth body with brown and yellow stripes that very closely resembled a yellow jacket’s. One of Melissa’s magazine photographers had captured the image of the fly that has evolved a protective disguise to trick potential predators. The fly is actually an insect pollinator as are many moths, butterflies, birds, and bats. Today’s picture of a fly mimicking a honey bee is one of the same species that I picked because it is positioned to clearly show the fly’s eyes. The eyes clearly identify the insect as a fly. 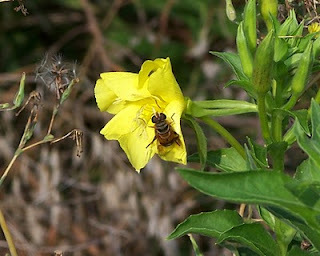 This one is pollinating an evening primrose. While the honey bee pollinates about 80 percent of our agricultural crops, the other pollinators serve an important role in filling in when honey bees are either not present or are lured away to more attractive flowering plants. The role of all of the pollinators is attracting increasing interest. One demonstration project for showcasing pollinators is the Melissa Garden in Healdsburg, California in the Russian River Valley. You may view pictures of the pollinator garden at http://www.themelissagarden.com/. “Melissa” is a Greek word for honey bee. Integrated Pest Management involves controlling pests by using a combination of measures to reduce their numbers. IPM techniques may be considered to be mechanical, like Small Hive Beetle trapping, or they may be biological, cultural, or chemical. There is a growing movement toward chemical-free beekeeping. While the concept is attractive, the beekeeper must be aware that in the short term there may be considerable colony losses, mainly due to parasitic Varroa mites and the viral diseases they vector. Even after one has begun a beekeeping program not relying on chemicals there may be more losses than expected. 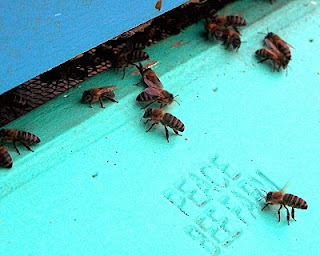 The benefit of chemical-free beekeeping is pests don’t build resistance to the treatments. Here are some Integrated Pest Management techniques that may be considered as biological and cultural controls: Frames of drone brood may be removed and frozen to kill Varroa mites developing in the brood. Place hives in full sun; damp soil in the shade supports Small Hive Beetles. Take measures to reduce drift and robbing. Both spread diseases. Limit the use of common feeding, another source of disease spread. Exploit weaknesses in pest life cycles. For example, Small Hive Beetles must leave the hive to pupate in the soil. Beneficial nematodes kill Small Hive Beetle pupae in the soil. Allow beneficial insects and other animals to do their part. Ants eat Varroa mites that fall through screened bottom boards. Bats eat wax moths at night when they are most active. Replace old, dark comb; because it can hold chemicals and spores of American foul brood and Nosema. Dust bees with powdered sugar to reduce Varroa mites. To further reduce mites, use naturally-based alternatives to chemicals, such as thymol-based essential oil products or organic acids. Don’t use the “hard” chemicals except as a last resort, applying according to labeled instructions to reduce mite resistance. Provide vegetable oil and sugar patties for tracheal mites. Don’t spill Small Hive Beetle larvae on the ground; bag slimed frames. 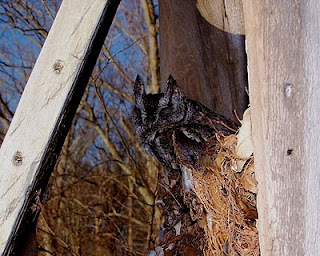 Today’s photo: biological control of mice at Peace Bee Farm, a screech owl. Dee Carlson has been studying the beekeeping literature and weighing the prospects of keeping bees without using chemicals, a decision that makes the beekeeper seem bold, yet vulnerable at the same time. Will my actions make my bees healthier or will I lose them altogether? Fortunately, the decision is not necessarily a choice of using or not using chemicals. A workable solution may be to decide to implement an Integrated Pest Management program that you design yourself. Pick from a menu of possible IPM techniques. You don’t have to give up chemicals completely, just move their use to the bottom of the list of choices. Let me offer a few items that may be considered in making an Integrated Pest Management plan: Reduce the stress on the bees. Stress is the common denominator in Colony Collapse Disorder. Stressed bees release alarm pheromone which attracts Small Hive Beetles from great distances. Use resistant stocks of honey bees bred for resistance to parasitic Varroa and tracheal mites. Raise queens and drones from survivor bees; they are adapted to conditions in your area. Mechanical controls are useful against pests; they don’t result in resistant pests. Here are some mechanical controls: Screened bottom boards reduce Varroa mite populations. Hive stands raised above the ground help to reduce Nosema and resist mammal pests. Providing adequate internal ventilation of hives reduces chalkbrood and Nosema. Use Small Hive Beetle traps. Use entrance reducers in cold weather to restrict mice. Also, use them any time you are feeding bees to prevent robbing and fighting at the hive entrance. Burn hive equipment and bees in the case of American foul brood. Terramycin only suppresses the vegetative, rod-producing stage of this bacterial disease. It masks the disease and does not kill the reproductive spores. Repeated use of Terramycin leads to resistant strains of AFB. Experienced trapper Bill Peterson is employing mechanical controls to remove an infestation of beavers flooding large areas of Peace Farm. Jill and Keith Forrester, the ever so imaginative and industrious farming couple who own Whitton Farms, have come up with plans for a new market in Downtown Memphis. They are building the market in the heart of the Downtown Medical Center to serve the Downtown workers and residents of the rapidly growing, revitalized urban area. The market will offer fresh, locally grown produce and flowers. Local cooks, bakers, and artisans will be making foods, artwork, and gift items. They plan to have fruits, grains, nuts, mushrooms, beef, poultry, pork, and fish. The market will be a pick-up point for CSA customers. CSA stands for “customer supported agriculture,” a concept that allows individuals to participate in the production of their own food. People who join a CSA pay a prescribed amount to the farmer in exchange for a portion of the harvest throughout the growing season. Typically, CSA members pick up a package weekly. The CSA concept is rapidly gaining acceptance by the public; many enjoy the variety of produce that becomes available with the changing season. For the farmer, the CSA offers crop payments early in the year, helping pay for fuel, seed, fertilizer, and other crop expenses. The CSA is an attempt to bring sustainability to family farms and other smaller scale farming operations. Jill and Keith have been joined by an eager group of farmers, friends, and supporters in turning the spacious building into Downtown Memphis’ first market of its kind. They have plans for the business to host a number of events. There is a stage for programs and musical events, a large bar to serve smoothies, and a kitchen to prepare meals from locally grown foods. The market is on the Madison Avenue trolley line which connects to the Main Street line just blocks away. 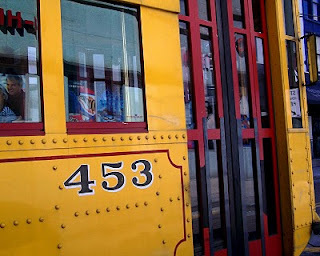 The trolley stops right at the door. Peace Bee Farm pollinates produce at Whitton Farms. We will bring honey from their flowers to the Trolley Stop Market. Visit http://whittonfarms.blogspot.com/. The Memphis Area Beekeepers Association held its Forty-Fifth Annual Short Course in Beekeeping today. One hundred thirty-nine people attended the one-day overview into beekeeping. Such programs are being conducted in local beekeeping associations across the country at this time of the year. New beekeepers are planning their hives in advance of colonies of honey bees becoming available in the spring. Interest in beekeeping is widespread. Paul Mallory is shown here as he began his portion of the program by asking, “Why would you want to keep honey bees?” Paul has been keeping bees for 66 years. He began his career as a queen breeder and producer of packaged bees in 1944. Paul was engaged in one of the early efforts to lessen the effect of the spread of Africanized Honey Bee genes as the aggressive bees moved across South America toward the United States. As part of a team committed to breeding European Honey Bees and exporting them to the affected region of Mexico, Paul bred nice, gentle queens. However, exporting honey bees to Mexico presented a problem. To get the bees through customs at the Mexican border, Paul passed the queens to nuns who carried the queens in their habits. 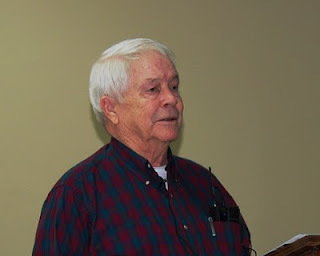 Paul Mallory served as president of the Memphis Area Beekeepers Association and the Tennessee Beekeepers Association. I am proud to have followed in his footsteps in both organizations, myself. Today, I followed Paul on the program. I gave a brief introduction into Integrated Pest Management strategies for beekeeping. I suggested the new beekeepers consider the trend of moving toward more chemical-free beekeeping. It was a pleasure for me when I made the nomination of Paul which resulted in his receiving an award from the Tennessee Beekeepers Association for a lifetime of service to honey bees and beekeepers. Paul’s charming manner is so disarming. I can’t think of anyone else who could entice nuns to smuggle bees in their habits. The Kentucky legislature is in the process of codifying into law the environmental practices that the coal companies have started using as they reclaim the land used in surface mining. The mining procedure is called mountain top removal. Just as the name implies, the entire tops of mountains are being removed to extract coal. The procedure is considered safer and more economical than digging mines into the earth. One serious problem with mountain top removal is rebuilding the terrain in a suitable manner using the rubble from the mining effort. The shape of the land and water courses must be rebuilt. The rocky soil must be compacted enough to safely hold in place. One of the problems with the compaction efforts has been the fact that trees and understory plants do not grow well in the hard, compacted soils. When the case was presented to Kentucky’s House Standing Committee on Natural Resources and Environment, the representatives voted unanimously in favor of the bill to continue the efforts to restore pollinator habitat and forage on reclaimed surface mining land. The mining companies will plant trees and understory foliage plants that provide habitat and food for honey bees, bumble bees, and other native pollinators. Coal Country Beeworks is placing honey bee hives on reclaimed mining sites and training individuals to build a beekeeping industry in the Appalachian Mountains of Eastern Kentucky. They have plans for developing a queen bee raising program with the goal of producing queen bees that are suitable for the local area. A part of the restoration effort is the planting of trees and understory plants that are beneficial to pollinators. These plants will include sourwood trees, famous for honey, and the American chestnut tree. This native tree once comprised one third of the forest before it was decimated by blight. 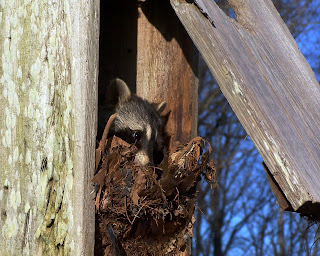 Today’s picture, following an environmental note, is a young raccoon that Rita and I found living in one of our wood duck nesting boxes. Congratulations, Kentucky friends. Honey bee colony losses have numbered close to one third of the managed hives for each of the past three years. Still, beekeepers are replacing their lost colonies. The months of February and March are often the harshest for the honey bees. After a long winter’s confinement in the hive, the bees’ stores of food are dwindling. The start-up of the colony’s population puts demand on food supplies in several ways. Brood nests must be warmed to greater temperatures than clusters of bees without brood. The larvae of the increasing population consume large amounts of both honey and pollen. 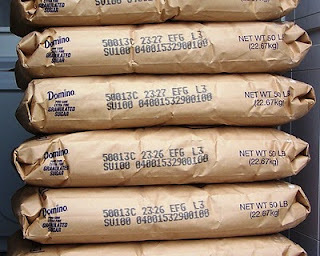 As supplies of food are being depleted, the demand for the food is increasing. This is happening before the great blooms of spring flowers. The earliest sources of nectar and pollen, dandelion, skunk cabbage, and red maple may bloom while the bees are confined to the hive due to cold weather. Beekeepers will find a number of their colonies have not survived the winter. The cause of the death of the bees is not always apparent. Starvation is probably the most common cause, and it is readily identified. Since the bees share food throughout the colony, the workers can be found with their heads in the cells where they died looking for the last of the food to pass around. If you click on the photo, you can see dead bees on the inner cover of the hive. The presence of drones indicates that this colony probably lost its queen in the fall. Colonies without a queen often retain their drones through the winter. The queen-less colony’s population dwindled till it could no longer warm itself. Other winter losses may occur as the result of infestations of mites or honey bee diseases, like Nosema. Early detection of the loss of the colony allows the beekeeper to protect hive equipment from scavengers, like the wax moths and small hive beetles, and prepare to start a new colony in the spring. The modern bee hive is a functional replica of the honey bee’s natural home, a cavity in a hollow tree. Designed by Lorenzo L. Langstroth in 1851, the hive is a series of open wooden boxes with removable frames holding beeswax comb for the bees’ brood nest and stores of honey. The hive sits on a bottom board and has a cover to protect the nest from the elements. The cover is usually one of two styles. Bee hives that are permanently placed and not regularly moved usually have a telescoping outer cover and a separate inner cover. The outer cover is called “telescoping” because it can move up and down a small amount. This outer cover can also be moved from front to rear a small distance to open or close a ventilation port in the inner cover. The outer cover overhangs the hive on all sides, providing a roof to shed rain from the hive. The inner cover serves several purposes. It provides a path to chimney air through the top of the hive to provide ventilation in both the summer and winter. The inner cover also provides the proper hive bee space to prevent the bees from gluing the tops of frames to the cover with propolis. Bee hives that are regularly moved from one location to another for pollination service usually employ a single migratory cover. The migratory cover does not overhang the hive on the two long sides. This flush fit of the cover allows for the hives to be tightly banded together for safe transport on trucks. Migratory covers usually offer lesser ventilation capability to the hive, and they are often more tightly sealed in place by the bees using propolis. 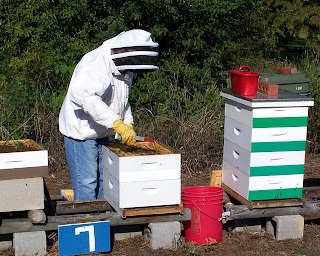 Both covers serve well, and their use is the beekeeper’s preference The Peace Bee Farm hives shown in the picture are equipped with screened bottom boards, medium depth hive bodies and honey supers, and telescoping outer covers with inner covers. Honey is the only food that we enjoy today that is unchanged from that which was eaten by our caveman ancestors. Honey is a unique food produced by a very unique insect, and is the only food provided to man by an insect. The honey bee is the only insect in the temperate region that remains alive and active throughout the year. It stays active through the winter by eating honey, a high-energy food, and generating body heat in their flight muscles. The honey bee is the only insect that can regulate its body temperature. Honey is produced by bees from the nectar of flowers. To produce one pound of honey, the bees must visit two million flowers and fly the combined distance of 55,000 miles, more than twice the distance around the earth. To place a tablespoon of honey on a hot, buttered biscuit requires the full life’s work of 32 honey bees. Raw honey is unprocessed and unchanged from the way it was produced by the bees. It is maintained at temperatures encountered in the bee hive. Honey is the only unprocessed food that does not spoil at room temperatures. Store honey on the table top, not in the refrigerator. All honey forms crystals of sugar over time, because some of the sugars that comprise honey are stable in the crystal form. Crystallization of honey does not damage its taste or quality. If you want to re-liquefy the honey, place the jar in a pan of hot water off of the stove with the cap removed. Never heat the honey in a microwave oven. You may be able to detect a difference in taste, aroma, and color of each jar of honey. That is because honey is concentrated flower nectar, and it varies according to the flowers that were in bloom at the time it was produced by the bees. 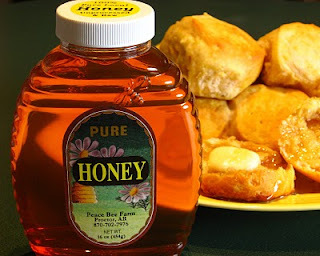 Enjoy honey and visit http://www.honey.com/ for recipes, honey health studies, and tips for using honey in baking. Whenever the weather permits the honey bees to fly from their hives early in the year, they often head to the low-lying lands and river bottoms. Here, they find the red maple, which is among the earliest blooming sources of nectar and pollen for honey bees. The red maple blooms from late January through March, and the scarlet flowers appear before the leaves. This early-flowering tree yields large amounts of pollen and a considerable amount of nectar. If flying conditions are favorable, large numbers of honey bees are attracted to the open flowers on the bare branches. However, the weather is often so cold and stormy that the bees are not able to take advantage of the abundance. Commonly found in the low ground above the banks of streams and rivers, the maples are important plants for the honey bee. They produce ample amounts of nectar and pollen necessary for the early start-up of the honey bee colonies’ populations. The red maple is followed in bloom by other maples. The silver maple blooms in February, and the sugar maple blooms in April. The box elder is a maple as well, and it blooms in April. The maples provide needed food for brood rearing, but the late winter colonies are usually too weak to harvest enough nectar to make a surplus of maple honey. The honey is described as having a fine flavor. Maple honey is white or amber colored with a faint pinkish tinge. Following pollination by the honey bees, the maples produce great numbers of seed pods that have a wing that allows them to spin like helicopters. The seeds are distributed widely by the wind, and they settle into the rich silt fill of old oxbow lake beds to begin the cycle of bottomland forest growth. In this way the honey bee helps restore habitat for wildlife, large and small. 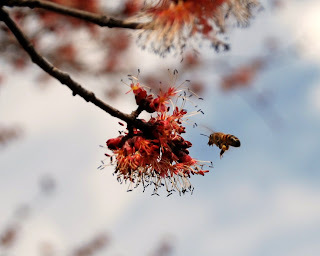 Click on today’s photo of a honey bee carrying pollen collected from a red maple blossoms. Reverend Lorenzo L. Langstroth made careful measurements inside natural honey bee nests. From his observations, Langstroth described the concept of bee space. He noted that the honey bees always build their nest with precisely spaced aisles between the sheets of beeswax honeycomb. These aisles, where the bees walk, measure between one fourth and three eights of an inch. Honey bees sometimes build their nest with straight, parallel sheets of comb; but, in nature, they often build a nest of twisting, folded sheets of comb. Regardless the shape of the combs, the bee space remains the same, roughly three eights of an inch, enough room for a bee to walk upright or two bees to pass shoulder-to-shoulder. With his concept of bee space, Langstroth designed the modern bee hive in 1851. The heart of the hive is the removable frame which holds the honeycomb. The frame is separated from all other surfaces, top, bottom, sides, and adjacent frames by one bee space of three eights of an inch. Langstroth noted that if there is an opening or crevice in the hive of less than a bee space, the bees will fill it with propolis, bee glue that they make from tree saps and resins. He also noted that spaces in the hive that are greater than a bee space are filled in with honeycomb, either full sheets of comb or oddly shaped burr combs. The Langstroth bee hive offered such flexibility to the beekeeper that it opened beekeeping as a modern agricultural endeavor. First, the removable frame allowed hive inspectors to examine the hive for brood diseases. Next, numerous hive manipulations became possible for the beekeeper: mechanical harvesting of honey, colony strength balancing, feeding frames of honey and pollen, making colony divisions, and rearing queens. Click on today’s photo to see a frame being removed from the brood nest. Capped cells at the edge hold the pupa stage; empty cells in the center reveal where adult bees recently emerged. The natural home of the honey bee is a cavity in a hollow tree. Honey bees select a storm damaged tree or one that has been hollowed out by birds and termites to move into when they reproduce the colony by swarming. They prefer to find a tree at the edge of the forest with a small, eastern facing knot hole located along the bottom of the cavity. Honey bees like to find a tree with a cavity of about 40 liters in volume. They prefer to have the entrance a considerable height above the ground. Of course, swarming bees do not always find a tree with a cavity fitting all of these desirable bee abode requirements. It is often easier for them to find a house with an opening leading to an inviting space between the interior and exterior walls. The honey bee has no interest in the appearance of its hive. It will gladly live in a dry hive that is freshly painted, unpainted, or old and worn. The walls or a house or the hollow, wooden columns supporting a porch are just as attractive as a modern bee hive to a colony of honey bees. The modern bee hive is a functional replica of the hollow tree. Designed by Lorenzo L. Langstroth in 1851, it is made of hollow wooden boxes which stack atop one another. 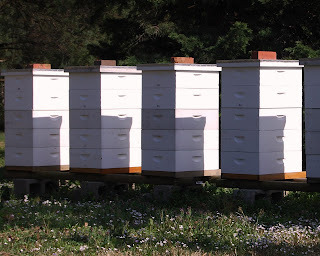 The lower boxes contain the frames of comb that hold the queen and brood. Langstroth’s original hive body had a depth of about nine inches. Two deep hive bodies have a volume of 84 liters and comprise the traditional bee hive. Some beekeepers, like us at Peace Bee Farm, find advantages in building bee hives of this same 84 liter capacity using three boxes of about six inches in depth. Above the hive bodies we stack the honey supers, as bees naturally store their honey above their brood nest. As many supers as are needed are superimposed on the hive. Bird watching is a pastime shared by millions of people around the world. The beauty of bird watching is that it can be done by anyone at any time and with the very minimum of cost or equipment. Birds can be enjoyed by people of any age, and the number of birds to be seen is virtually limitless. Counting the population of the various species of birds gives researchers considerable insight into environmental matters affecting the birds as well as other species, even humans. Once a year a four-day event called the Great Backyard Bird Count looks at where the birds are located across North America. This year’s count, a joint project of the Cornell Lab of Ornithology and the Audubon Society, will be held February 12 through 15, 2010. The larger the number of people collecting and reporting sightings of birds, the more meaningful the project becomes. For information about how to participate in the project, visit birdsource.org or birdcount.org. While all that is needed to enjoy the birds and participate in the project is ones eyes and ears, a pair of binoculars or a camera can enhance your ability to identify the different species of birds. Books guide you to certain field marks to look for. Red tailed hawks are quite common in the Delta in the winter. Yes, the top of their tail is red. However, the birds vary greatly in appearance from one bird to the next. They have one common field mark, their white breast, which allows us to identify them easily. 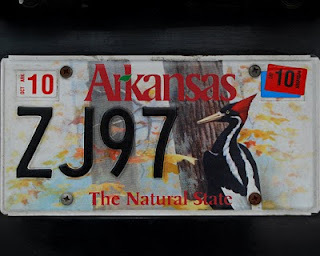 We can tell that a red bellied woodpecker is in the area by its clear call of, “Chuck, Chuck, Chuck.” Today’s picture is of the license plate on my truck. Arkansas brags about its ivory billed woodpeckers, for years thought to be extinct, but found in the Cache River Basin 50 miles west of Peace Farm. The field mark of the ivory billed woodpecker is the white stripe up its neck. Let’s find more! Tammy Horn is a soft-spoken beekeeper who has been able to move people who literally move mountains. Coal mining companies in the mountains of Appalachia have been increasingly employing a technique of mining called mountain top removal to extract coal without digging mine shafts. As the name implies, the tops of mountains are taken apart and the coal removed, leaving the rubble of remaining rock and soil. Following land restoration rules which were not designed to optimize the environmental effect, the coal companies restore the scarred landscape by pushing the rubble into contours. The rubble is then compacted using heavy machinery. Tammy, who grew up in Hazard, Kentucky and learned beekeeping from her grandparents, recognized the potential for using the restored coal mine land for beekeeping. There exists a need for economic development in Appalachia, and Tammy sees in beekeeping a potential cottage industry. The area is also the natural range for some of the best of the honey plants: tuliptree, black locust, and sourwood. 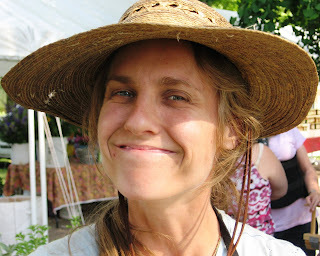 Tammy helped convince the coal companies that they could alter their reclamation techniques to make the mountain soil suitable for growing nectar-producing trees and plants. The magnificent American chestnut is even being reintroduced into its native Appalachian range. Go to http://planetgreen.discovery.com/travel-outdoors/coal-mines-bee-friendly.html to follow the great environmental work that the coal companies, universities, foresters, and beekeepers are doing to improve life and the environment in what Tammy sees as a “honey corridor” in Eastern Kentucky and West Virginia. She wants to put bee hives on the 33,000 acres of reclaimed coal mine land and establish “genetic islands” of honey bees. Today’s photo, taken by Alice Jones, shows Tammy Horn and her colleague, Allen Meyers, working bees at the James River Coal site near Hazard, Kentucky. There’s yellow clover in the foreground and sourwood in the margins of the forest. Tammy is the author of an excellent history, Bees in America: How the Honey Bee Shaped a Nation. I’m anxiously waiting for her next book. The modern bee hive was designed in 1851 by Philadelphia minister Lorenzo L. Langstroth. He developed the hive after making extensive observations and measurements of natural honey bee nests. Langstroth noticed one detail that had not been described in hundreds of years of man’s handling honey bees. The bees always maintain a space of three eights of an inch between sheets of honeycomb. That’s just enough space for two bees to pass shoulder to shoulder. Langstroth designed a wooden bee hive using the available lumber sizes of the day. The secret to the success of the Langstroth design was a frame to hold the honeycomb which was surrounded on all sides by a space of three eights of an inch. As the frames could be removed from the Langstroth hive, the design became widely accepted. 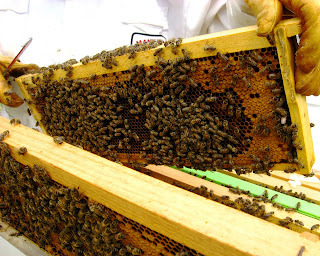 Removable frames enabled hive inspectors to carefully examine hives for brood diseases, especially the highly communicable American foulbrood. The Langstroth bee hive is actually a working replica of the honey bee’s natural home, a hollow tree. This hive is a series of stacked, hollow wooden boxes arranged vertically like a standing tree. In keeping with the honey bee’s natural design, the bee hive has a small entrance located low on the hive. For protection from the weather, the bee hive has a cover. Bee hives have a bottom board which serves as a floor. There is often a landing board at the entrance, which is similar to a porch on a home. Honey bees select natural cavities in trees which are large enough to have space below the combs of the brood nest. This space serves an important role in protecting the hive from many parasites. Mites which fall from the brood nest are devoured by beneficial ants in this space. 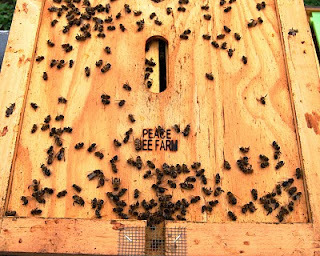 The modern screened bottom board, like the one shown in the picture, serves the colony the same way by allowing parasitic mites to fall from the hive to be eaten by ants. I sent a photo of the swan that I spotted yesterday to Van Harris who writes a regular article about birds for the Memphis newspaper, The Commercial Appeal. 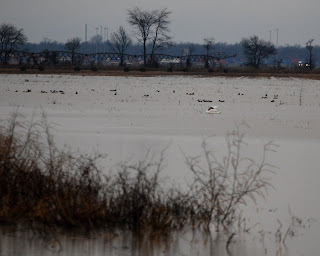 Van, a former president of the Memphis Chapter of the Tennessee Ornithological Society, said that it is likely that the swan was possibly not a trumpeter swan, but instead North America’s other native species, the tundra swan. As its name implies, the tundra swan lives in the arctic tundra. Its winter-time migration normally takes it to the East or West coast of the United States. Both birds are quite similar in appearance, with the tundra swan somewhat smaller in size. Van directed me to The Trumpeter Swan Society, a conservation group involved in restoration of the species that came very close to extinction in the early 1900s. You can view the group’s efforts at http://www.trumpeterswansociety.org/. I will continue to watch this swan and report it to the group. By observing new locations for trumpeter and tundra swan migrations, the group attempts to plan conservation efforts in the South. Habitat restoration efforts for swans benefit numerous other species. This single swan shared a large flooded rice field with hundreds of northern shovelers, mallards, and northern pintails. The wildlife that we observe serves as an indicator of the condition of our environment. The presence of waterfowl in particular illustrates the successful efforts of many concerned individuals and groups. With the honey bees tightly clustered in dry hives, consuming enough honey to maintain warmth, I often venture out the Delta back-roads to get in some winter bird watching. The Arkansas Grand Prairie and Delta region is the winter home for much of North America’s waterfowl. Large numbers of ducks, mainly mallards, from the central provinces of Canada winter in the wet agricultural fields. Here, the waterfowl find an ample supply of grain spilled by mechanical harvesting. The birds also derive considerable amounts of protein from mollusks and earthworms. Snow geese converge by the thousands on fields of winter wheat, where they pull the tender, green plants, roots and all, from the soil. Covering the ground, the white snow geese and their color phase of the same species, the blue goose, appear as dirty snow. All wildlife has four habitat requirements: food, water, space, and cover. The Delta provides plenty of food and water, and the space is wide open for miles on end. While most wildlife needs escape cover in which the creatures may flee into protective woods, the waterfowl employ their sense of sight, gregarious behavior, and use of sentry birds to protect themselves from predators. 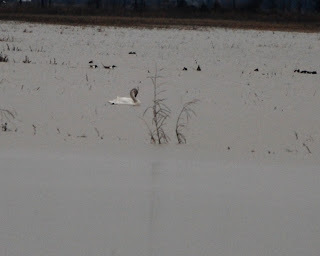 Click on today’s picture to see a trumpeter swan, a rare find in this area. The trumpeter is the largest waterfowl in North America and the largest swan in the world. I observed this single swan feeding on aquatic plants in a flooded rice field along with Northern Shoveler ducks. This arctic visitor was the first trumpeter I’ve found in the wild. Farmers often close drain pipes in levees surrounding level fields to allow the area to flood in the winter. While the flooded fields provide winter habitat for the waterfowl, the birds serve the farmers by sifting weed seeds from the mud. Good winter-time nutrition leads to greater reproductive success for the waterfowl. Nutrition is, likewise, being seen as being of great importance in managing healthy honey bees. When the honey bee split from its wasp ancestors about 100 million years ago, it took on a diet based upon food derived from the newly evolving flowering plants. A mutually beneficial strategy for survival of the bees and the flowering plants soon developed. The bees found carbohydrate in the sweet and attractive nectar from the flowers. They also found protein, fats, vitamins, and minerals in the pollen that these new flowering plants produced. Between the nectar and the pollen the bees assembled a complete diet needed to reproduce and thrive. With the honey bees’ assistance, the flowers got pollinated and reproduced in a much more efficient manner than had existed before when plants relied on the wind to distribute pollen. Together, the honey bees and flowering plants flourished. The flowering plants that reproduced most effectively were the ones that were the most successful in attracting honey bees and other available pollinators. They attracted the bees by offering a reward of sweet tasting nectar. They also provided attractive odors and visual clues to help the bees find the flowers. Blossoms developed with various colors, shapes, and patterns of petals. Many flowers developed ultraviolet nectar guides to direct the honey bees to the center of the flower to help ensure effective pollination. While honey bees survive quite well with their unique ability to gather nectar and make high-energy food, honey, to carry the colony through dearth and winter seasons without available food, managed colonies do need supplemental feeding at certain times. Beekeepers regularly feed bees heavy syrup of sugar or high fructose corn syrup, both healthy bee foods, in the fall for the bees to convert to stored honey for the winter. Over winter, beekeepers can feed fondant, a candy made of sugar and corn syrup. In the spring, beekeepers often stimulate the bees to forage by feeding the colonies diluted syrup similar to the sugars in flower nectar. Beekeepers also use sugar syrup to deliver medications to the colonies when necessary. The New York Times reported today on a study that will appear in the February 15 issue of The Journal of Experimental Biology. The report discusses research that has been conducted on how honey bees recognize human faces. While the researchers were interested in finding clues as to how the honey bee with a brain many times smaller than a human could accomplish some of the same tasks, they revealed honey bee behavior that many beekeepers observe. According to the Times article, bees and humans use the same techniques to distinguish faces even though the human brain has 100 thousand times the capacity of neurons. I have often heard beekeepers comment about the behavior exhibited by their bees. Many feel that the bees truly get to know their keepers. I feel that I am virtually ignored by the guard bees of hives of the bee yards that I visit most frequently. The honey bees have an extremely acute sense of smell, and most recognition of the beekeeper is probably done by detecting odor. However, there are times that honey bees certainly seem to be able to recognize people by their faces. For a week after I harvest honey, I can expect to have bees seek me out and sting me. These are bees from hives that I walk about without protective gear throughout the year. A day or two after harvesting their honey, I have had bees greet me with a sting as soon as I open the door to step from my truck. Were they irritable after being robbed of their honey, or did they remember the face of the robber? This interesting Times story can be found at http://www.nytimes.com/2010/02/02/science/02bees.html?hpw. The authors of the study indicate that it was their intent to see if honey bee behavior could reveal mechanisms that could be employed by computers for use in facial recognition. Today’s photo is one of the pleasant faces that the bees like to recognize, horticulturist and beekeeper Dallas Holland.